Shillong: After a delay of almost ten years since its commencement in 2002, a strategic bridge over the Umkhen river was inaugurated by Chief Minister Dr Mukul Sangma on Friday. 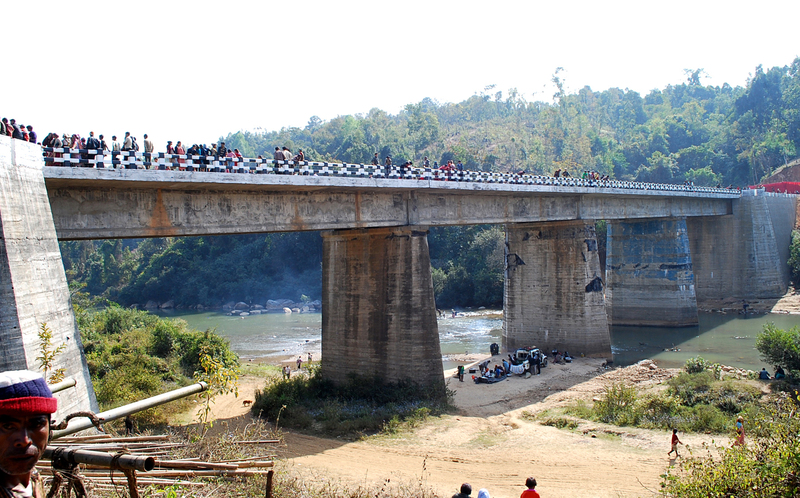 The bridge which would interlink the two districts of Ri Bhoi and Jaintia Hills and strategic to the Shillong Bypass, has been constructed at an estimated budget of Rs 499.03 lakh. Speaking on the occasion, the Chief Minister asserted that the State Government, despite facing financial crunch, was committed to improving the road communication all over the State. According to Dr Sangma, the Government has recently sanctioned Rs 65 crore for the Jowai-Nartiang-Khanduli road, besides approaching the Central Government to sanction all the pending road projects meant for the State. The inauguration which was earlier scheduled for Feb 13, was preponed with the objective of bypassing all the empty trucks to Jaintia Hills from Ri Bhoi to ease the traffic congestion in Shillong. Incidentally, many people present at the function on Friday observed that the road leading to the bridge was small and was unlikely to bear the heavy trucks that would pass through it. The Chief Minister assured that the road leading to the bridge would be expanded and widened soon. “This road has become very important and if we widen the roads it would enable the traffic to pass through it and it will also open new opportunities for the people,” Dr Sangma added. PWD minister HDR Lyngdoh, who was also present at the function, informed that the Government will sanction Rs 80 crore for a total of 91 bridges across the State under the 13th Finance Commission. He also informed that the State Government will soon proposed the road as a major district road besides converting it into a national highway. Several senior legislators, deputy commissioners of both Ri Bhoi and Jaintia Hills, other Government officials and a large number of local people attended the inauguration function.